This GZDoom mod totally converts Doom, Doom II, and Final Doom into a full-fledged Aliens game. You must face Weyland-Yutani androids, predators, and xenomorphs a celestial battle for survival. I have combined aspects of my other mod, Aliens: The Ultimate Doom with Aliens (TC) . A graphically overhauled and expanded version of the Warrior Xenomorph, along with a more advanced and deadly AI. As well as a multitude of new death-states. Weapons and items included from Aliens: The Ultimate Doom. I have left the textures the same, as they were from the original. With the exception of changing the Sky, and adding some dynamic lighting. Slight-randomization of items and weapons, while not deviating too far from the original layout. Expect updates in the future. Corrects sprite clipping error for ground items. 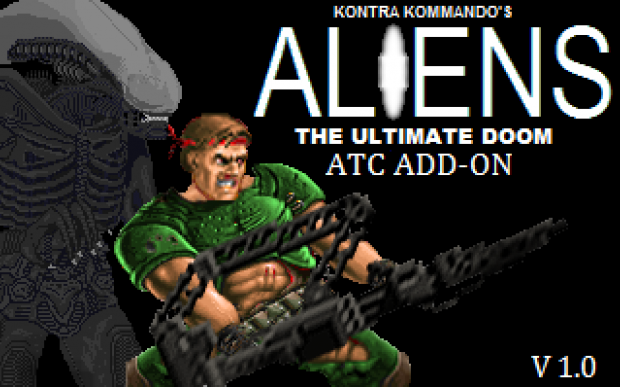 After you unzip the file, select all of the files in the "ALIENS (TC) 2017", and drag and drop them over an up-to-date version of GZDoom. Works exclusively with episodes 2 and 3 of Ultimate Doom. This mod is not meant to be played with other levels. For more recent versions of GZdoom, I also recommend turning on the bloom-effect.It gives the flashlight a clearer, and more realistic look. When I drag and drop the unzipped files onto gzdoom, it starts regular Doom 2 but with xenomorph enemies. What am I doing wrong? This mod only works with the first doom. It replaces episodes 2 and 3. Great job so far but there is one problem with your mod. Every ACS script which can be called by player (like toggling flashlight, dropping flare etc) should be NET type. Otherwise you cannot call it in multiplayer (Zandronum) causing you to be unable to use flashlight and other features. What keys will need to be bound for stuff like toggling the smart gun's different modes? nice i love the new stuff will any of the new stuff be apart of the gameplay version? Yep, plus a lot more. seam to be having an issue with some of the sprite textures. The holes and srips from the ceiling are floating at about chest height and there seems to be a bunch of stock Doom lighting sprites visible throughout the maps (the skull torches and evil eyes in particular). I'm noticing that the port doesn't seem to be seeing BEX files to add them to the loading pathway. I'm guessing that's were you were loading in your replacement sprites and definitions? Yeah I can confirm of having the same exact issues with the Android Beloko port. Forgive my utter ignorance on this subject... But maybe that .DEH file should be replaced in favour of putting everything into .pk3 or .wad files? I'm having this exact same issue. i will give credit to you and Justin Fisher. When I try to download it says Download timeout, whats going on? It let me download the older version. this is amazing but how do i use the flashlight !? Hey, I used ZDoom launcher to play the game. All loaded like a charm but when I zoom on the rifle with the acog sight I only see black the part of the screen on 4:3 I play 16:9 (1080) Is there any way to fix this or I have to play on 4:3 resolutions¿?. i saw a video on youtube about this mod,its a shame in the readme says ''This mod is not meant to be played with other levels'' would be so cool if this would be compatible with other level wads,anyways this is a badass mod indeed. any help on the weird things about chest height not allowing me to pass through them? and those pesky doom torches?!?! Help for proper loading/install instructions. Posted for those who go straight to comments and for people who don't read the description for whatever reason. Use with Ultimate Doom episodes 2 and 3 ONLY. Normal: Drag and drop in the order the files are in the folder to GZDoom executable. ZDL: In the Add Files window, patch files (*.bex *.deh) are not included in the default file type option, and must be changed, and by extension need to be selected separately from the other files. Once done, prioritize the regular files and patch files in the order they are in the folder. After either is done, set sprite clipping to always. If done correctly, all textures should be in place, no doom lamps and other immersion breaking sprites/textures, and movement between corridors should not be blocked by sprites. If Kontra_Kommando is okay with this, I can upload a revision of the instruction.txt that is included in the zip file with this information to Mediafire. If you drag the folder onto GZDOOM, make sure the files with the WADs are loaded first, then the DEH and BEX files after the wad files. Then it will work. Otherwise, you get all sorts of weird sprites in the middle of the map.